Rashmi Metaliks is one of the leading Pig Iron & Steel manufacturing companies today, with a capacity of 1.5 million MT per annum. Expanding from its existing set up of Pig Iron & Sinter Plant established in 2007 with a capacity of 4 lakh MTPA, the company came up with its own Billet producing Steel Melting Shop in 2009 and Rolling Mill in 2010 for the production of TMT Bars with a capacity of 2 lakh MTPA. 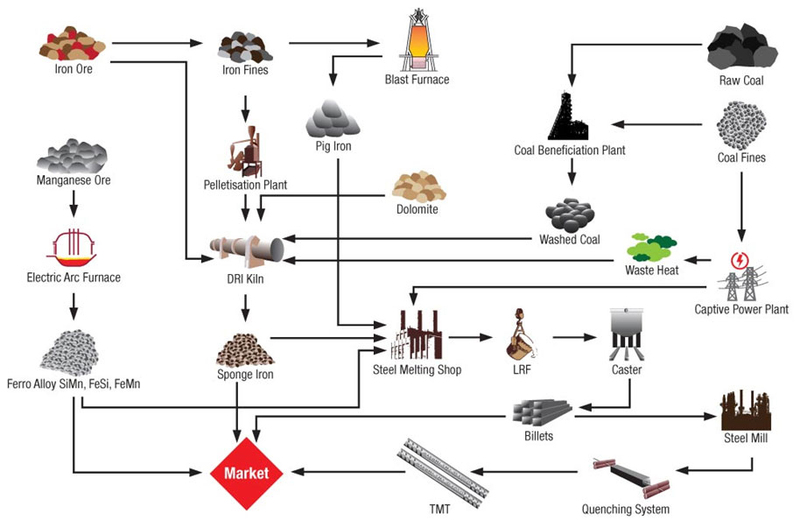 Raw materials are treated at the DRI (Direct Reduced Iron) plant. High quality billets are obtained from the steel melting shop. Billets are passed through the state of the art rolling mill. Self Tempering process is used to result in a structure called ‘Tempered Martensite’. Atmospheric Cooling process comes into play where heat of the core area tempers the Martensite part and the ductile core becomes the Ferrite Pearlite structure. Martensite part is hardened, apt to withstand load of bigger proportions, while the Ferrite-Pearlite part is ductile and endowed with elongation properties. Mechanical & chemical tests are done at par with IS 1786:2008. TMT Bars are cut into required length, bundled up and tagged. 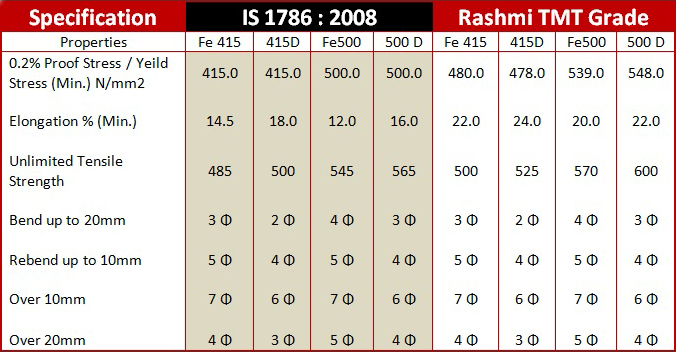 Rashmi TMT Bars are sold to government agencies, industry houses, civil contractors and real estate developers. They are ideal for flyovers, dams, bridges and other critical structures where high yield load is required without compromising on the quality & ductility. Has higher UTS/YS ratio that makes it resistant to seismic loads and be the best choice for earthquake prone areas. Meets recognized specifications for the UTS/YS ratio, thereby providing constructions with high strength and high ductility. Controlled water-cooling prevents the formation of coarse carbides which is the main cause for corrosion. Raw materials used in the production of bars have low carbon content that lead to superior corrosion resistant properties. Earthquake resistant: The Thermo Mechanical Treatment attributes higher elongation to the Rashmi 500D TMT Bars that make them resistant against earthquakes. Corrosion resistant: At the time of manufacturing, the outer surface of Rashmi 500D TMT Bars form a hard Ferric Oxide layer in presence of moisture and air when they are treated on the Cooling Bed. This coating helps the bars resist against corrosion. 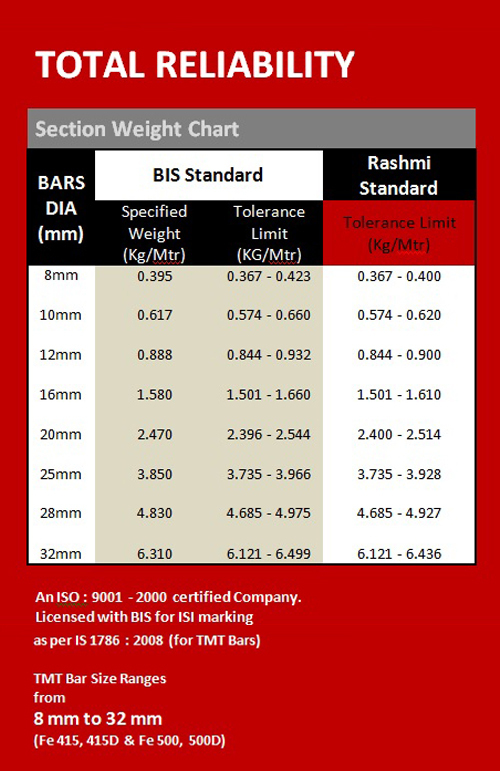 Fire resistant: In comparison to ordinary CTD bars and TOR steel bars, Rashmi TMT Bars are specially manufactured to tolerate heat up to 600ᵒ centigrade. Extra strength and ductility: Combination of tempered martensite on the surface and fine grain ferrite-pearlite in the core provides higher strength, toughness and ductility to the TMT Bars. Super bondability: TMT Bars strongly bond with their surrounding concrete that adds to the strength and firmness of the construction. Higher weldability: Raw materials used in the production of TMT Bars have low carbon. This ensures higher weldablity of the bars. 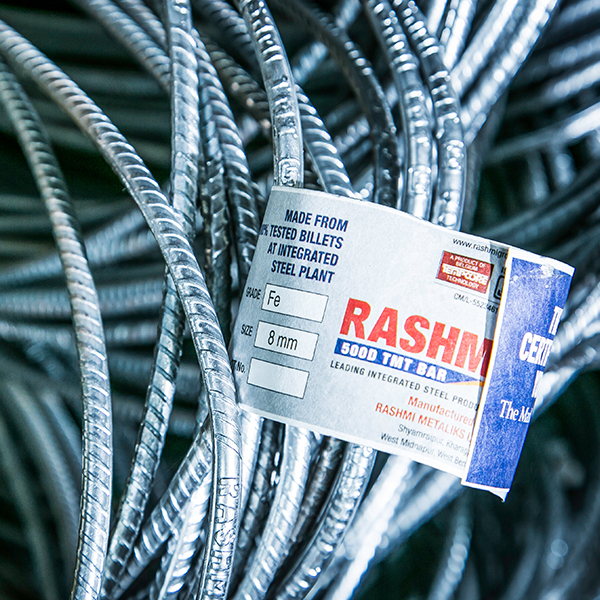 Steel saving: Maintaining a low tolerance of sectional weight enables Rashmi TMT Bars to save 15% approx in steel consumption, compared to others.